Preface. About the Author. Culture, Behavior, and Pathology. Culture, Stress, and Illness Reactions. Culture and Psychopathology: Specific Phenomena. Culture and Psychopathology: General Disorders. Culturally Competent Clinical Assessment. Culturally Competent Clinical Care. Culturally Competent Psychotherapy. Ethnicity, Culture, and Drug Therapy. Culture and Therapy with Special Subgroups. Culturally Oriented Care for Different Ethnic Groups. Some Social Phenomena and Therapeutic Considerations. Subject Index. Increasingly, psychologists are becoming aware of sensitivity needs with respect to treating patients from differing cultures. Culture can play an important role both in what a patient discloses about themselves, how likely they are to follow a therapist's advice, and whether specific therapies are likely to be effective for them. 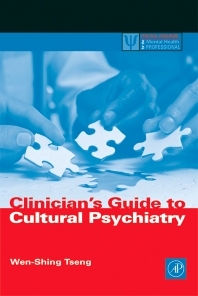 Following on the heels of Tseng's "Handbook of Cultural Psychiatry" comes this "Clinical Application of Cultural Psychiatry." This more concise book focuses on information most relevant to treating patients. The book discusses how culture plays a role in specific disorders (depression, anxiety, eating and sexual disorders, substance abuse, schizophrenia, etc.). relevant sensitivities to keep in mind in treating specific patient populations (age groups, differing religions, and differing ethnicity's). Clinicians in private and group practice. Wen-Shing Tseng, M.D. is a professor of psychiatry at University of Hawaii School of Medicine. He has served as chairman of Transcultural Psychiatric Section of World Psychiatric Association for two terms from 1983 to 1993, and presently is honorable advisor for the Section. As a consultant to the World Health Organization, he has traveled extensively to many countries in Asia and the Pacific. He is currently a member of the Board of Directors of the Society for the Study of Psychiatry and Culture (USA), and guest professor of the Institute of Mental Health, Beijing University, China. Relating to the subject of culture and mental health, he has coordinated numerous international conferences in Honolulu, Beijing, Tokyo, and Budapest. He has edited or authored more than a dozen books, including Culture and Psychopathology and Culture and Psychotherapy. University of Hawaii School of Medicine, Honolulu, U.S.A.